Brian’s earliest cartoon memories are of drawing James Bondesque comics in second grade. His cartoons appeared in monthly grammar school newsletters and then jumped to the St. John’s High School Paper (where he promptly found himself in the Principal’s office to explain the meaning of a giant soap-on-rope that had crushed a small sedan). Public debate over his cartoons followed him to Holy Cross, where next to the sports section, his strip was the most read feature. 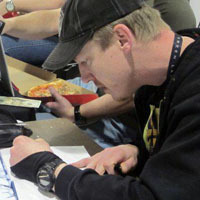 Escaping the walls of Academia in 1996, Brian pursued a career as a graphic designer and comic book artist. With comic book work scarcer then Metalica songs at a wedding, Brian published his own comic book series "Absence of Light." He also worked as an editorial cartoonist for his hometown newspaper, "The Town Crier." Brian sent his college strip to the Syndicates in 1998. Although there was interest in developing the feature, Brian knew this wasn’t THEE strip for him. For the next few years Brian spread his focus on his dark comic book visions and fledgling screenwriting career. All that changed in 2003. In a matter of months he became a Husband, a homeowner, and father of a chocolate lab puppy. With the support of his wife, Tammy, and the inspiration of his dog, Sophie, he created "Dog eat Doug." The daily strip debuted online in 2004 and launched in newspapers in 2005. The strip continues to enjoy a growing, international fan base. He writes and illustrates odd picture books for kids including "Nighty Night, Sleepy Sleeps", "The Prince’s New Pet" and the upcoming "Monster Chef's".